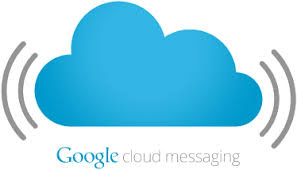 Google Cloud Messaging (GCM) is a service that facilitates messaging between mobile apps and server applications. 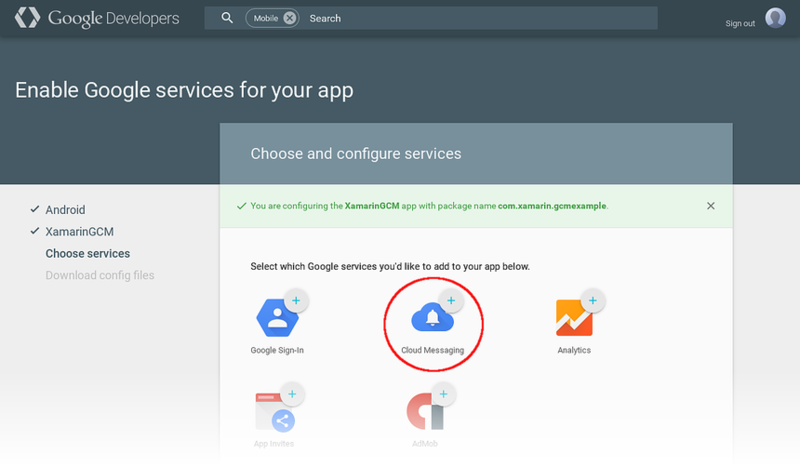 This article provides an overview of how GCM works, and it explains how to configure Google Services so your app can use GCM. 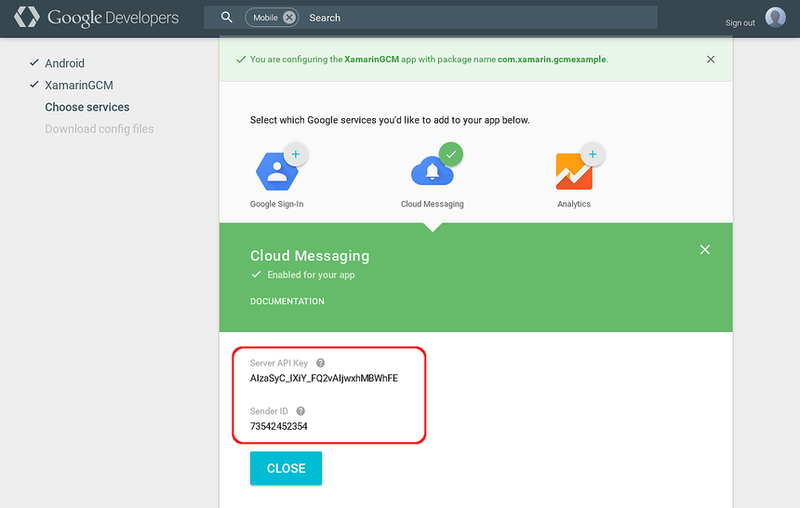 This topic provides a high-level overview of how Google Cloud Messaging routes messages between your app and an app server, and it provides a step-by-step procedure for acquiring credentials so that your app can use GCM services. GCM has been superceded by Firebase Cloud Messaging (FCM). GCM server and client APIs have been deprecated and will no longer be available as soon as April 11th, 2019. Using GCM, app servers can send messages to a single device, a group of devices, or a number of devices that are subscribed to a topic. Your client app can use GCM to subscribe to downstream messages from an app server (for example, to receive remote notifications). Also, GCM makes it possible for client apps to send upstream messages back to the app server. For information about implementing an app server for GCM, see About GCM Connection Server. When downstream messages are sent from an app server to a client app, the app server sends the message to a GCM connection server; the GCM connection server, in turn, forwards the message to a device that is running your client app. Messages can be sent over HTTP or XMPP (Extensible Messaging and Presence Protocol). Because client apps are not always connected or running, the GCM connection server enqueues and stores messages, sending them to client apps as they reconnect and become available. Similarly, GCM will enqueue upstream messages from the client app to the app server if the app server is unavailable. API Key – The API key gives your app server access to Google services; GCM uses this key to authenticate your app server. 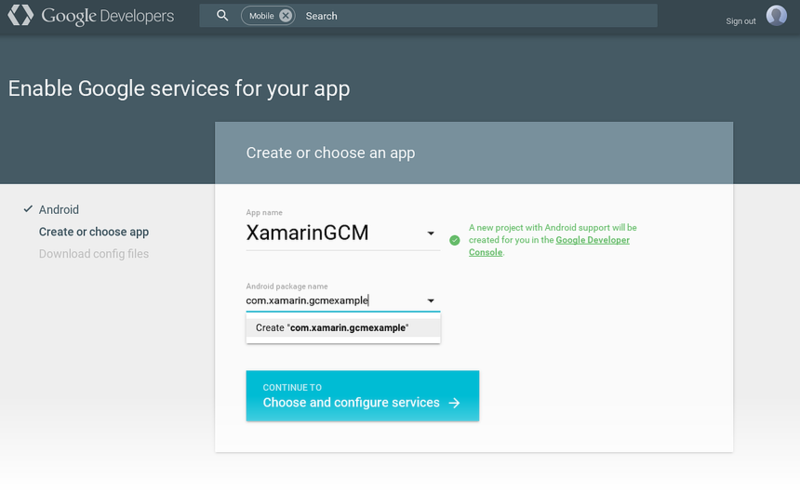 Before you can use the GCM service, you must first obtain an API key from the Google Developer Console by creating a project. The API Key should be kept secure; for more information about protecting your API key, see Best practices for securely using API keys. Sender ID – The Sender ID authorizes the app server to your client app – it is a unique number that identifies the app server that is permitted to send messages to your client app. The sender ID is also your project number; you obtain the sender ID from the Google Developers Console when you register your project. Registration Token – The Registration Token is the GCM identity of your client app on a given device. The registration token is generated at run time – your app receives a registration token when it first registers with GCM while running on a device. The registration token authorizes an instance of your client app (running on that particular device) to receive messages from GCM. Application ID – The identity of your client app (independent of any given device) that registers to receive messages from GCM. 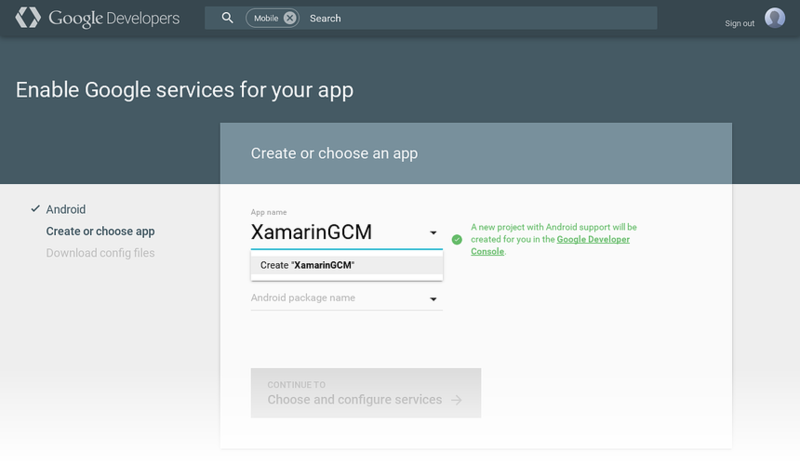 On Android, the application ID is the package name recorded in AndroidManifest.xml, such as com.xamarin.gcmexample. 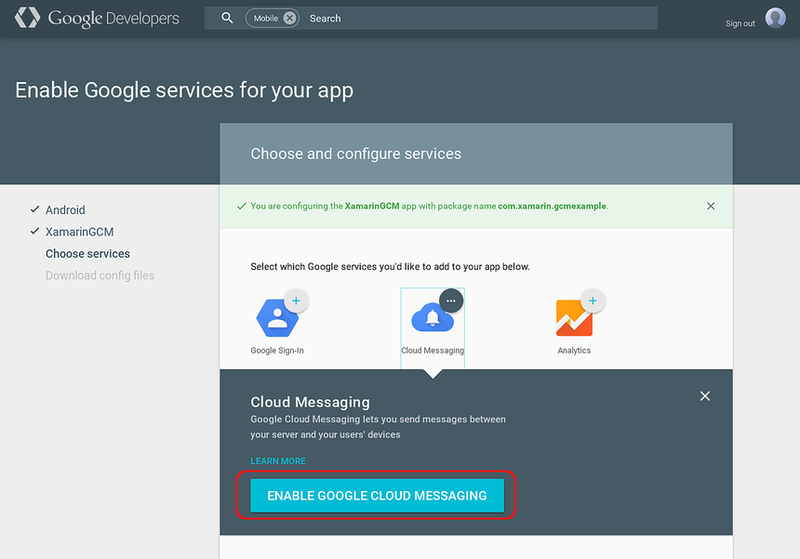 Setting Up Google Cloud Messaging (later in this guide) provides detailed instructions for creating a project and generating these credentials. The following sections explain how these credentials are used when client apps communicate with app servers through GCM. The client app contacts GCM to obtain a registration token, passing the sender ID to GCM. GCM returns a registration token to the client app. The client app forwards the registration token to the app server. The app server caches the registration token for subsequent communications with the client app. Optionally, the app server can send an acknowledgement back to the client app to indicate that the registration token was received. After this handshake takes place, the client app can receive messages from (or send messages to) the app server. When the client app no longer wants to receive messages from the app server, it can send a request to the app server to delete the registration token. If the client app is receiving topic messages (explained later in this article), it can unsubscribe from the topic. If the client app is uninstalled from a device, GCM detects this and automatically notifies the app server to delete the registration token. Google's Registering Client Apps explains the registration process in more detail; it explains unregistration and unsubscription, and it describes the process of unregistration when a client app is uninstalled. The app server sends the message to GCM. If the client device is not available, the GCM server stores the message in a queue for later transmission. When the client device is available, GCM sends the message to the client app on that device. The client app receives the message from GCM and handles it accordingly. For example, if the message is a remote notification, it is presented to the user. In this messaging scenario (where the app server sends a message to a single client app), messages can be up to 4kB in length. For detailed information (including code samples) about receiving downstream GCM messages on Android, see Remote Notifications. Topic Messaging is a type of downstream messaging where the app server sends a single message to multiple client app devices that subscribe to a topic (such as a weather forecast). Topic messages can be up to 2KB in length, and topic messaging supports up to one million subscriptions per app. If GCM is being used only for topic messaging, the client app is not required to send a registration token to the app server. Google's Implementing Topic Messaging explains how to send messages from an app server to multiple devices that subscribe to a particular topic. Group Messaging is a type of downstream messaging where the app server sends a single message to multiple client app devices that belong to a group (for example, a group of devices that belong to a single user). Group messages can be up to 2KB in length for iOS devices, and up to 4KB in length for Android devices. A group is limited to a maximum of 20 members. Google's Device Group Messaging explains how app servers can send a single message to multiple client app instances running on devices that belong to a group. The client app sends a message to the GCM XMPP connection server. If the app server is disconnected, the GCM server stores the message in a queue for later forwarding. When the app server is re-connected, GCM forwards the message to the app server. The app server parses the message to verify the identity of the client app, then it sends an "ack" to GCM to acknowledge message receipt. The app server processes the message. Google's Upstream Messages explains how to structure JSON-encoded messages and send them to app servers that run Google's XMPP-based Cloud Connection Server. Note that this package name is also the application ID for your app. Protect the API key – it is not intended for public use. If the API key is compromised, unauthorized servers could publish messages to client applications. Best practices for securely using API keys provides useful guidelines for protecting your API Key. Google's Registering Client Apps describes the client registration process in more detail, and it provides information about configuring automatic retry and keeping the registration state in sync. RFC 6120 and RFC 6121 explain and define the Extensible Messaging and Presence Protocol (XMPP). This article provided an overview of Google Cloud Messaging (GCM). It explained the various credentials that are used to identify and authorize messaging between app servers and client apps. It illustrated the most common messaging scenarios, and it detailed the steps for registering your app with GCM to use GCM services.